The Trump administration ratcheted up pressure on Venezuela's President Nicolas Maduro on Wednesday, announcing U.S. recognition of the country's opposition leader as interim president and signaling potential new sanctions against its vital oil sector. U.S. Secretary of State Mike Pompeo, in a statement, called on Maduro to step aside and urged the country's military to support efforts to restore democracy. Venezuelan opposition sympathizers had been urging Guaido to assume the presidency since Maduro was inaugurated to a second term on Jan. 10 following a widely boycotted election last year that the United States and many other foreign governments described as fraudulent. 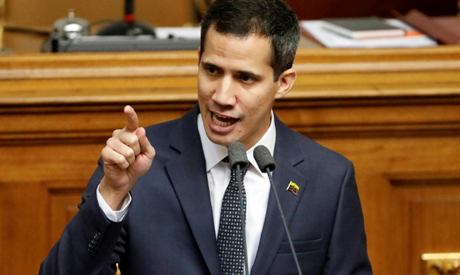 The 35-year-old Guaido has energized the opposition with a campaign to declare Maduro a usurper and has promised a transition to a new government in a nation suffering a hyperinflationary economic collapse. The sources acknowledged that formal recognition of Guaido would be complicated by questions of how to deal with Venezuela's U.S.-based diplomats and who would now control its bank accounts and other U.S. assets. It was also unknown whether Guaido and the opposition-controlled Congress would now try to exert control over Citgo, the U.S. refining arm of Venezuela's state-run oil company PDVSA. Such a move could also backfire if Maduro used Guaido's swearing-in and U.S. recognition of him as a pretext to take action such as detaining him. Canada also plans to recognize Guaido, a Canadian government official said on Wednesday. U.S. officials are considering a range of potential measures, including restricting U.S. imports of Venezuelan oil or even a full ban, to punish Maduro's government, but no final decisions have been made as Washington closely watches the street protests unfolding in the country, two people familiar with the matter told Reuters. The administration's decision on whether to go ahead could depend on how harshly Maduro cracks down on protesters and how he responds to Guaido's swearing-in, several of the sources said. Since late last year, the White House has also been considering whether to put Venezuela's on the U.S. list of state sponsors of terrorism, U.S. officials have said. U.S. refiners such as Valero, Chevron and PBF Energy have had discussions about the possibility of such sanctions with the Trump administration in recent weeks, and companies have already started bidding up prices for alternative types of crude to replace the Venezuelan grades. Venezuelan crude exports to the United States last year fell 15 percent to the lowest annual average in nearly three decades, according to Refinitiv Eikon data, as fast-declining oil output and financial sanctions continued to hit sales. Still, some U.S. refineries have equipment specifically designed for heavy grades of crude like those from Venezuela. They imported about 500,000 barrels per day (bpd) last year, according to the U.S. Energy Information Administration.